I hope to get these ships painted up at least by this week, so they timing of my decals arriving in the mail should time out well. Federation ships to paint 3 Frigates, 2 Battle Frigates, and 1 Heavy Cruiser. 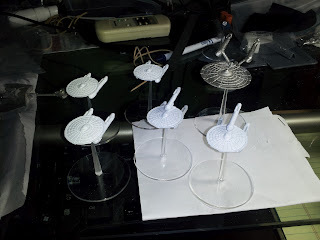 Everything but the Heavy Cruiser is painted with 1 or two coats of white, which I painted on thin so I wouldn't get clumping of paint and to preserve the detail.